Misconceptions about the Tarot abound, but P.C. Tarantino helps the curious shrug off rumor-fueled black magick connotations, at the same time she improves accessibility. Tarot for the New Aeon aims to simplify instant readings and create interested students who feel confident about learning more. Aleister Crowley was the original creator of the Thoth Tarot deck. He was a smart Englishman who had monumental mother-issues, a trust fund to spend and a low opinion of humanity. He loved to shock and cause spectacles; some still drag his name through the mud decades after his demise. Tarantino pays little attention to Crowley’s personality or actions, neither endorsing nor condemning, but takes pleasure in sharing his clever designs. The section on the Qabalah includes an intricate “Tree of Life” with Hebrew names for the positions, interconnections, and levels of perception. It seems like a brain-bending topic, but the author summarizes the point by saying that Qabalah suggests one use intuition to decide what course of action is best, and then act. Coverage of this ancient system could have been more insightful. P.C. Tarantino has been working with Thoth Tarot cards nearly thirty years. She began to teach Aleister Crowley’s form in 1984. Kedron Bryson pulls a double assist here, handling both design and editing. Some duplication of reference charts occur between sections, in order to keep the reader from flipping back and forth. By discovering one’s authentic nature (our link with the divine), and living in alignment with this nature, we would be able to determine the correct path for ourselves. 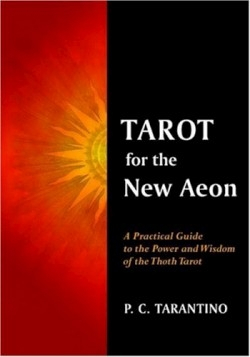 Interested neophytes who pick up a copy of Tarot for the New Aeon can absorb enough with a couple free hours to begin some of the more basic readings on themselves. Those short on patience may concentrate on an appendix called “Bottom Line Interpretations.” As with any subject, it is best not to rely on a single source for complete understanding, but Tarantino has done a good job of opening the gate.